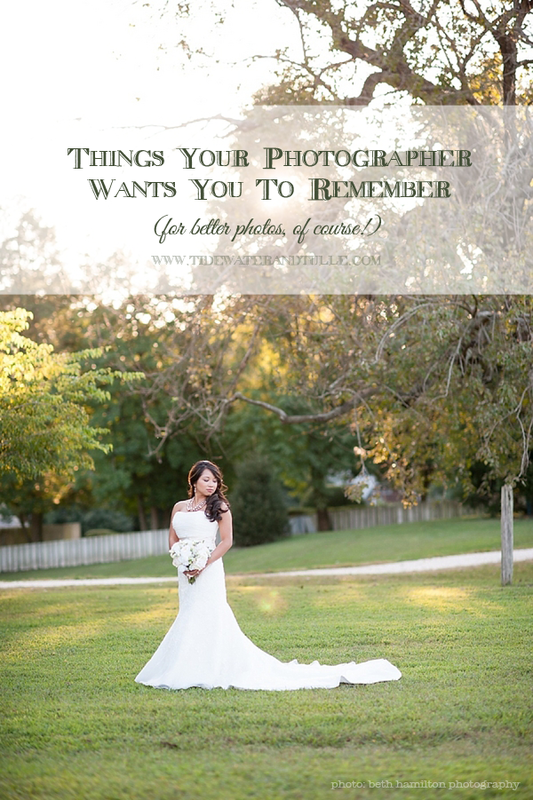 Your wedding photographer is one of the pros on your wedding team who is with you the longest. From getting ready to reception departure, they've seen it all when it comes to big days-- no matter if the weddings take place at home or in a grand ballroom. Since they are pretty much experts in wedding time flow and details, I reached out to Hampton Roads wedding photographers to get the scoop! What would they want brides and grooms to remember on the big day? What is going to help make their images go from beautiful to sheer visual perfection? Well, you'll just have to read below to find out! "If you want to have a reception exit, have a sign that tells guests when it will be taking place. If they know the exit is just 20 minutes away, they'll probably stick around to send you off instead of slipping out early. And if the exit will take place after dark, sparklers will photograph the best." "Smile throughout the day! As silly as it sounds, practice your smile in the mirror. You'll recognize your own smile and be comfortable with it. Then when your big day comes you'll be confident and naturally show it off a lot more! This goes for brides AND grooms!" "Bring a non-plastic hanger for the gown. A gown that you only wear once, spend lots of money on, and is gorgeous. It deserves to be on a pretty hanger for a dress shot!" It's not directly photography-related, but I always remind my couples to drink lots of water. Even if they don't feel like eating, the water thing is vital! Bring a case of water for your wedding party to share. Not just good for the skin, but it also helps with your energy levels and keeps you pepped up during those longer photo timeframes like family formals. We lose a lot of water when we least expect it, especially during the summer, so no worries about those potty breaks and big poofy gowns! You're just replenishing what your body needs. And if you don't see your photographer drinking water, make sure he or she does so as well; he or she's probably losing a lot more running around! There is no greater bummer on the big day than an entire wedding party with heat exhaustion! "This is less about photography and more for the bride, but I always tell my brides to look in the mirror! Sometimes brides get so worked up getting to the next step that they forget to look at themselves and enjoy! I'm speaking from my own experience as a bride, too." "Don't forget to clean your engagement ring for those close-up shots!" "Skip the gum on the wedding day and instead provide mints to those who need fresh breath! Consider putting them in welcome bags, the bathrooms at the reception, gift bags for wedding party, and especially in your getting ready gear. This way no one will accidentally walk down the aisle chewing away or end up with endless chewing pictures (or even worse, film footage). We want to see confident smiles in front of our cameras." "If you want pictures of the details, be sure to lay out any special jewelry, shoes, garters, and the sort before I arrive so that I can be sure to capture them for you." "We are there to serve you and capture the beautiful moments between you and your new husband or bride, and if you have a request - ask! While we would love to have mindreading skills, we need to hear you because we want you to have the best pictures of the best day of your life!" "Unless you have a fun choreographed dance planned, try not to talk or sing the entire first dance song. You might get unwanted awkward open mouth photos! Just enjoy and spend time snuggling and dancing together." "If you can avoid it at all costs, don't have your ceremony outdoors in the middle of the day in open sunlight. Just don't. The sunlight will give everyone raccoon eyes and make harsh and unflattering shadows on everything. Obviously this isn't always something that you will have control over but moving your ceremony back just a few hours to give you the benefit of prettier sunlight that is lower on the horizon will make your photographer's job of making everything look like it was from a storybook that much easier. If you absolutely can't do anything about it, build some time into your day closer to sunset so that the photographer will have some pretty natural light to wrap your love-fest all up in. 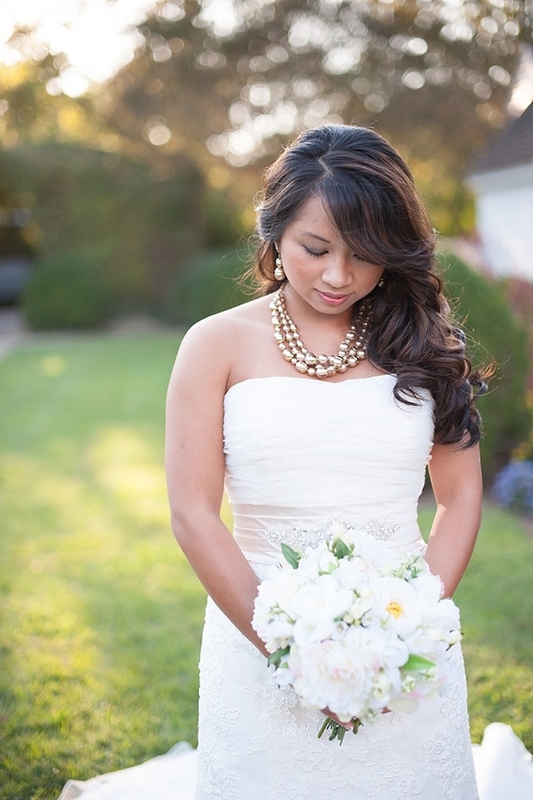 Ask your photographer about "golden hour" if you want to make their day." 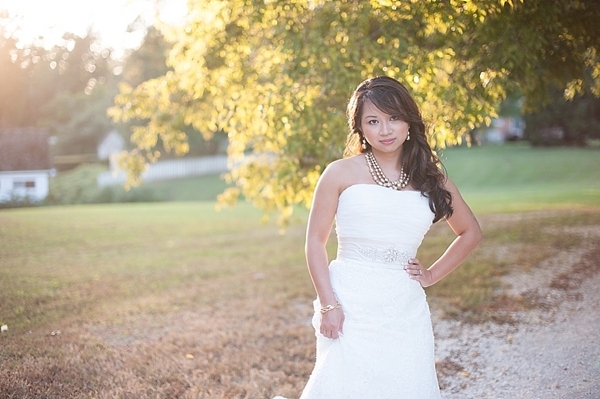 Do you have a tip to add to help make wedding day photos look better? Share in a comment! All photos by Beth Hamilton Photography.